The Green Party supports reparations, fights against environmental racism and takes an unambiguous stance against police brutality and deportation. So why aren’t more African-American and Latino voters paying attention? Election cycle 2016 has kicked into high gear, and the unrelenting battle for political power between the Democratic Party and the Republican Party has taken center stage. This political paradigm is not new. It was a scathing indictment of the two-party system that still holds true today, with one caveat: There is a viable third-party option, the Green Party. The Green Party first entered black America’s consciousness on a large scale with the 2008 candidacy of former Georgia Rep. Cynthia McKinney and Rosa Clemente, who together formed the first all-women-of-color presidential ticket in United States history. Though McKinney and Clemente were not successful in their presidential bid, their dilligence, and that of such hip-hop legends as Immortal Technique, has kept the Green Party on the nation’s radar, paving the way for Dr. Jill Stein—the party’s 2012 presidential nominee and current front-runner—to reach black and Latino voters in a way that may have been impossible just eight years ago. But eight years ago, there was then-Sen. Barack Obama reinvigorating America’s imagination and reintroducing cynical and apathetic voters to this nation’s possibilities. If the impossible could happen—the election of the first black president—what else might this nation be capable of achieving? As it turns out, more of the same and, in many ways, worse—a corrupt, two-party system that gave Wall Street love taps on the wrist for the chaos it inflicted in the lives of everyday Americans, the continued privatization of education and expansion of the prison industrial complex, the erasure of black women from social-justice initiatives, wealth inequities that continue to widen along racial fault lines, heartwrenching child poverty, police brutality that continues to devastate communities of color, a war on drugs that continues to target low-income communities of color, and the catastrophic effects of environmental racism that have come to the fore everywhere from Flint, Mich., to Baltimore to Selma, Ala. This is not to say that there has been no progress in recent years—including the Supreme Court’s legalization of marriage equality and now-President Obama’s executive decision to ban solitary confinement for minors—still, some successes, such as the Affordable Care Act, which has made health care accessible for millions of Americans while leaving the most marginalized communities in Republican-led states without options, feel like settling. Yet, many voters dwell in the land of “lesser of two evils,” a place of fearful pragmatism and resignation, where borders and walls prevent them from reimagining what true democracy could and should be. This is by design, which is why, despite some valid critiques, Clemente continues to support the Green Party. “The Green Party is definitely needed,” Clemente told me when I reached out to her. “It’s what an electoral, political party should represent, and its values, around issues of social justice, racial justice, women’s rights, education, the environment, as well [as] demilitarization here in the United States and abroad, is really key. Though Clemente believes that this stagnation is hindering the Green Party from reaching the 5 percent of the vote it needs to reach major-party status, she also still believes in the party’s future. 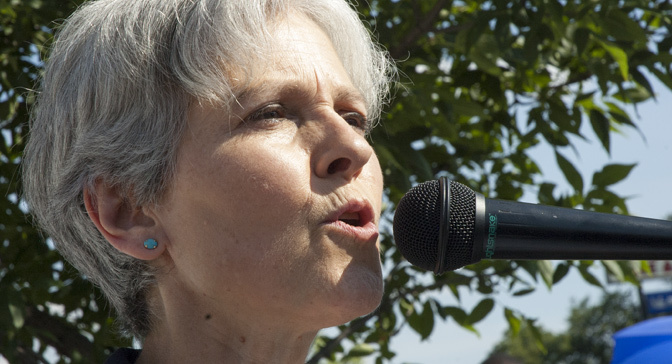 Though Stein didn’t directly address Clemente’s charge of liberal racism within the Green Party as it is, she did speak to what she personally strives for the party to become. So, how exactly does the Green Party plan to move forward and make its mark on national politics? In our candid conversation, Stein discussed the pervasive, corporate influences that corrupt both the Democratic and Republican parties, the critical need for restorative justice (yes, Bernie Sanders, Hillary Clinton and President Obama, this includes reparations), the importance of allowing Green Party candidates to participate in presidential debates, and the influences of Alice Walker and the Malcolm X Grassroots Movement’s National Action Plan for Racial Justice Now on her platform. Read a few key excerpts, then listen to the entire conversation, which follows. Our feeling is that we need a party which is of, by and for everyday people that doesn’t accept money, not only from super PACs, but not from lobbyists and not from corporate CEOs who have lobbyists and an ax to grind, so we are very carefully set up in a way that we cannot be corrupted. We cannot be bought out, and the spirit that Cynthia McKinney and Rosa Clemente brought to American politics is exactly what we are building, with many people who are very involved, who were also involved with those races as well. … we have several lawsuits right now to open up the debates, because if people hear this, we win. We win the day when Greens and Socialists get heard. So, [for Democrats and Republicans] it’s all about suppressing information. I want to affirm what Alice Walker said, which is that the biggest way people give up power is by not knowing that we have it to start with, and what the Democratic Party will do is try to talk you out of your power as they have done and look how much good that has been doing for all [of] us, but in particular, no one has paid a bigger price than the African-American community. It’s time for us to stand up and lead the way forward. This year, we have really prioritized getting on the ballot in Southern states that generally don’t have a choice, and this is where huge numbers of African America votes. There are more black votes and black voters in Georgia than in New York, so we’re really making an effort. This is an emergency. It’s an economic and racial-justice emergency and it needs a solution now. And when I mention things like having investigators at the ready to defend the communities, and having a system control board so that the police are serving the community, not the other way around, those are just two details. There needs to be much bigger system reform … it’s not just policing, it’s also courts and prisons, which are basically set up to lock up an entire race of people … and the courts make that happen. So, any one thing we’re going to do needs to be part of a very big program reform, and you put your finger on it, this system of locking people up and criminalizing poverty is outrageous and needs to be rejected and remade, and we need to move toward a system of restorative justice, which is about looking at communities and intervening before violence has occurred, and that means violence on the part of police. It means addressing poverty so that poverty doesn’t exist to be criminalized. This is where you begin to really sift the economic racism, and the economic violence that dovetails with the violence of policing … this whole system of policing is just, you know, it grows out of slave patrols, it’s about retribution at best, but it’s about oppression as well. It’s really key that we address economic racism, which is also violent and which also has severe consequences. So we’re calling for a job as a human right for everyone at living wages, and to ensure that the communities that are most burdened, and that’s communities of color and poor communities, that they are first in line and not last in line … our focal programs [are] directed to bring jobs first to low-income and African-American communities that are hurting the most and most need good jobs and most need resources put back in the hands of communities from whom these resources have been stolen. Reparations needs to happen. And this is a community that has been robbed blind, that built magnificent architecture and our transportation systems; they’re low-income people of color, in particularly slaves on whose backs this country was built. And we can’t stop at reparations, we need to totally reform the economy, and let me just say that this is not just some pie in the sky thing, we can do this. There’s a lot that Bernie Sanders articulates in the Green Party agenda, but we do have areas of difference. We’re the only campaign that will actually bail out students and poorer students, and these are young people and people going into middle age who are still swamped with student debt … there are 43 million people now who are trapped in student debt. If that word gets out … and we’re the only campaign that will cancel it. This is not a revolution of one person; more power to Bernie Sanders, for his agenda, but he’s in the wrong party. And he’s already promised that he will support Hillary Clinton when the Democratic Party pulls their kill switch. There’s been a lot of energized, progressive campaigns going way back inside the Democratic Party that the Democratic Party will trash, and there are various ways. They did it to Jesse Jackson, who had a great campaign going, who was winning primaries in big Midwest states, high-population states he was winning, and then they created this disinformation campaign, a smear campaign, about him being anti-Semitic, because he raised some questions about Israel, I guess, but these questions need to be raised, and we raise them ourselves. Bill Clinton is already very busy cornering all of these superdelegate votes, which pretty much guarantees that Hillary is going to beat Bernie; even if he’s beating her in the polls, they can beat him back … it’s hard to go into Super Tuesday these days when you have lots of primaries on the same day. [Bernie] doesn’t have a super PAC, they’ll get out and they’ll beat him back. You can’t trust the predators who’ve thrown us over the cliff here, and that’s not to say that there aren’t some differences between the [Democratic and Republican] parties, but there are not enough to save your job, there are not enough to get the police off your back, and to liberate the African Americans that have been imprisoned and incarcerated. We need to liberate everyone who’s in jails under this unjust war on drugs, which is basically a war on African Americans, and they need to be provided the support to actually re-establish themselves in their communities and have access to housing and education and loans and all those things that we currently deny people who have served their time, for unjust reasons that they were even locked in jail to start with. One thing I would say is what exactly has the Democratic Party done for you to make you trust it? Why trust it now? Look at the track record. There’s a war overseas on whom? On black and brown people. And the war at home, and we militarized our schools, we militarized our police forces, these SWAT teams that were created supposedly to fight terrorists, are basically fighting the war on drugs … and this is a war that has no end, in the same way as the so-called war on terror, it has no end. It just further oppresses communities that are really struggling. Half of our tax dollars are going into these wars for oil and they spill over into militarizing our communities, militarizing our borders, and we’re creating the immigration crisis to start with through the war on drugs, which has killed over 100,000 people in Mexico alone, and now NAFTA [North American Free Trade Agreement], these so-called free-trade agreements, that are supposed to be good for American workers, they’ve been devastating for American workers. Twenty-five-million Latinos who vote, in addition to 12 million undocumented Latino Americans, but the 25 million Latinos who vote, have learned very clearly that the Republicans are the party of hate and fearmongering, but the Democrats are the party of deportation and night raids and detention. And this has been an absolutely human-rights nightmare. So if those communities alone got word that there is a way forward, this revolution becomes a self-fulfilling prophesy. We are pouring a trillion dollars a year into this failed militarism abroad that spills back at home and has been used as an excuse to strip communities of resources … schools have been targeted for closure and the education policy that Obama has led the charge for, sadly to say, that education policy has closed thousands of schools in communities of color, and what do they do? They just force children and families to travel greater distance to equally unfunded and mistreated schools, and high-stakes testing is devastating to the very kids at risk that it was supposed to be helping … the answer to education is actually getting rid of poverty. And we know how to do that. We know how to get rid of poverty. We need to start teaching young people about lifetime learning … not teach them what to think, but help them support their creativity and their curiosity, to be the real lifetime learners that they deserve to be. Stop this system of privatizing our schools, using poor test scores which reflect poverty, using this as an excuse to privatize these schools and further rip off public dollars that should be put into a great education system for everyone.